From mid-May to mid-July I did a board game Kickstarter analysis and watched the tabletop category closely. (Mainly because I wanted to get to know the competition for my own project “Movie Empire”, but then I thought this is valuable information that should be shared.) That means I analysed a lot of board games and card games, but omitting things like RPGs, wargames or 3d scenery. Many of the numbers were already known or obvious but some did surprise me. So come along. Let’s get some numbers crunched. There were 373 campaigns starting in this timeframe. 128 (34%) are still live. 127 (34%) have been successful. 63 (17%) were canceled by their respective creator. 55 (15%) failed to reach their goal. More than 270,000 backers pledged for their favorite game and wrote about 118,000 comments. The total pledge amount is nearly 20 million dollars. But only 10% make it above 100,000 dollars (still an amazing number) and more than 40% don’t even reach 2,500 dollars. So it is probably no surprise that nearly 6 of these 20 million dollars are from 19 miniature-heavy games only. That means that 5% of all projects get 30% of all the money and the other 95% must share the remaining 70% of the money pledged. The average campaign length is 28.9 days – nearly 40% of all campaigns set the end date after 30 days. Tuesday is still strong. Nearly 40% of all campaigns started on this day of the week. And most of them between 3pm and 9 pm CEST / 9am and 3pm EDT. Nearly all of the 7% of projects that feature expansions are funded right now. They are bringing their audience right from the start. The country of origin was no surprise at all. 74% of the projects come from English-speaking countries – in this case the US and the UK. Even the strong European board game community in Germany, France and Poland does only accumulate less than 10% of all campaigns. Well, what would a Kickstarter analysis be without getting new information out of it? Let’s dive right into some interesting data. 12% of all game designers don’t get discouraged by failure – they relaunched their Kickstarter campaign. 5% even for the 3rd time or more. Regardless of that: failing for the first time with your project is definitely okay. But you have to think about what you did wrong and where you could improve things. This one is rather interesting and confirms my point of view. Coincidence or not, but backers want trustworthy and engaged project owners on Kickstarter. And this one really surprised me. 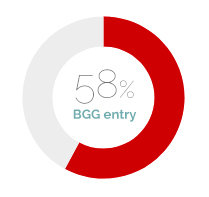 Only 58% of all campaigns have an existing entry on BoardGameGeek. This is – for me as a backer – one of the essential things. And it doesn’t cost the creator anything. For me it is like “either he doesn’t care or he doesn’t know BoardGameGeek at all”. Both answers are a red flag to me. 3% are based on an existing IP. This means there is already existing material like a book or a movie to the theme that was used. That’s a lot if you consider the licensing fees involved. (Well, on the other hand, not every project was licensed beforehand. Big, bad mistake.) These IP-based board games should get a dedicated blog post in the future, cause there’s alot of controversy going on, if there are enough resources to make a great game after paying the fees or if that doesn’t matter at all. 17% of all games are playable solo. That is an ongoing trend. What surprised me is that these solo playable games have a better success rate: 45% instead of the overall 34%. I don’t think that this is solely due to the solo player mode. But people want it. That’s for sure. I had a lot of fun with this little side project and I decided to continue this Kickstarter analysis for some more months. There is still so much information in these data that I collected that I am not finished yet analyzing it all. But I will write another blog post with further information soon. In the meantime why not read another post from me: “Make your board game Kickstarter successful”. Most of the info there is still valid. That’s right, Chris. Although sometimes I get the feeling that a solo mode is purely made to reach solo players but not that strong as the “real” game.